(NaturalNews) From NHK World TV Live, broadcasting from Japan: "TEPCO says the Fukushima nuclear power plant, #3 reactor, the water cooling system seems to have stopped. Technical officials are trying to confirm the situation. 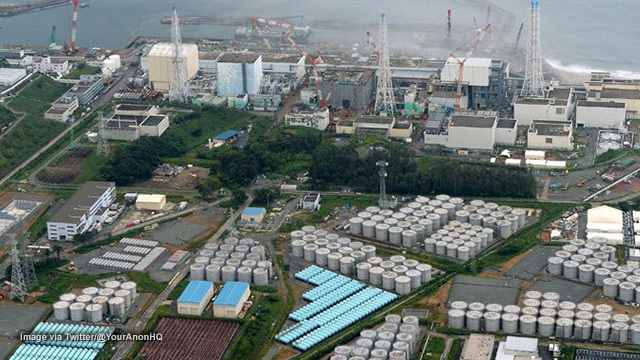 More than 2500 spent fuel rods are being kept at the pool at Fukushima. 2544 fuel rods are being kept at the spent fuel pool at the third reactor." "The tide level is rising... from the nuclear power plant at the third reactor of Fukushima, the water cooling system has stopped and water circulating to cool the fuel pool has stopped, however the water at the fuel pool is enough to keep the fuel pools cool... the water in the pool is enough and therefore it is not going to create a dangerous situation immediately..."
"We will continue to capture any information about any damages, so we can swiftly move on to take counter actions. Since tsunami warnings have been issued, please evacuate these areas..."
"A 90cm tsunami hit a port... there are reports of minor injuries. The tsunami warning is still in effect. They have issued a tsunami advisory... the tsunami will hit repeatedly... a magnitude 7.3 earthquake struck off the coast at 5:59 am local time. A short while ago, a 90cm tsunami hit the port of..."
"Please evacuate immediately in order to save your life... don't go back... get to high ground..."
A massive 7.3 magnitude earthquake struck off the coast of northeastern Japan earlier this morning, Japan time. A ten-foot tsunami wave is expected to strike the coast of Japan within minutes or hours. The Fukushima-Daiichi nuclear power facility is located there and was severely damaged in a 2011 tsunami event that led to a nuclear meltdown of some of the fuel rods. Since 2011, the fuel rods have remained exposed to the open air, and Japanese nuclear officials stated that it would take "100 years" to solve the Fukushima nuclear fuel problem. If the fuel rod pools fail, it will unleash massive radiological pollution across the Northern Hemisphere, polluting most of North America with radioactive isotopes such as cesium-137. This isotope falls onto soils and renders farm lands unusable for farming for 200 - 300 years (the half life of Cs-137 is 29 years). Stay tuned at FukushimaWatch.com and Natural News. My Health Ranger Store carries potassium iodide pills, which will quickly be depleted everywhere as citizens purchase KI to protect their thyroid from radiation damage. I just checked our inventory and we only have 3000 units in stock. We also offer this nascent iodine pack, which provides your body with elemental iodine that can displace radioactive iodine-131. I am also preparing to conduct emergency manufacturing and large-scale donations of my patented Cesium Eliminator formula where needed, should cesium-137 become a common radioactive contaminant following another Fukushima catastrophe. I have stockpiled 10,000 kg of manufacturing material for this purpose, in anticipation of a nuclear / radiological event that would threaten many lives. I have already pledged to donate this material to victims in areas hit by radiological events.